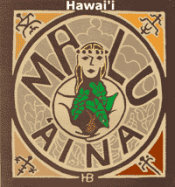 Malu 'Aina » Blog Archive » The Ugly American Syndrome! « Nuclear Regulators Like Bank Regulators: Fox in the Hen House! Published by jalbertini on May 30th, 2013 in Hawaii Independence, Military, Public Events, Radiation, Social Justice, Take Action!. I get it now. The military believes it can best clean up its DU mess on military bases by bombing the hell out of it. I suspect the rationale is that if you bomb it enough, it will disperse off base and little will be found on base. These guys are nuts. Put a restraining jacket on them now!